The consecutive dry years (2012-14) in Northern California have illuminated the pressures on the Sacramento Valley’s water resources and the challenges we face in providing reliable water supplies for various beneficial purposes in the Valley. Groundwater resources are critical, with groundwater providing nearly 30% of the region’s water supplies, with this percentage greatly increasing during dry years and during sustained droughts. Recent reports and maps show that the groundwater resources in the Sacramento Valley are being actively managed and monitored, as shown below and as seen at the CASGEM website: http://www.water.ca.gov/groundwater/casgem/. The preservation of Northern California’s groundwater resources is critical to the economic, social and environmental fabric of the region. 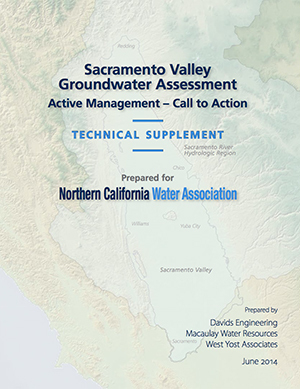 As part of ongoing efforts to achieve sustainability, water leaders, through the Northern California Water Association (NCWA), have made a concerted effort over the past several years to assess Sacramento Valley groundwater resources, both for groundwater levels and quality. Our objective is to help bring the region together to actively manage our water resources—both surface and groundwater—to assure sustainable water supplies for cities and rural communities, farms, fish, birds and recreation. Sacramento Valley Groundwater Assessment. Macaulay Water Resources, Davids Engineering, and West Yost Associates prepared a Sacramento Valley Groundwater Assessment, which provides an overview of the Sacramento Valley’s groundwater resources and the evolving efforts to better understand and actively manage the resources to provide sustainable benefits for the Sacramento Valley. The report provides a discussion on the historical development of land and water resources; the ongoing efforts for sustainable groundwater management; the effects of increasing use of groundwater; and recommendations for the future. Most importantly, the report summarizes long-term trends within the Sacramento Valley that affect our groundwater resources. Although groundwater levels in the Sacramento Valley have been generally consistent–draw down during dry years and then recovery in wet years–we are starting to see certain areas where groundwater levels are not recovering as they have in the past. While we cannot yet distinguish between the impacts of the ongoing drought and what may be longer-term changes to the Sacramento Valley water balance, the lack of surface supplies and the expanding and intensifying use of groundwater in the Sacramento Valley are contributing to this dynamic. There have also been reports by the California Water Foundation that suggest subsidence may be occurring in certain parts of the Valley, particularly in areas where there are no surface supplies available. Groundwater Quality Assessment. CH2M HILL has developed a Groundwater Quality Assessment Report (GAR) for the Sacramento Valley, which will provide water resources managers and the leaders in the water quality coalitions with a current assessment of groundwater quality in the region. The GAR provides a rigorous review of regional settings of irrigated farmlands in the Sacramento River watershed, including agriculture practices, soils and hydrogeology, and existing groundwater monitoring networks and data. In this manner, the GAR serves as an initial framework that establishes the technical basis of the groundwater quality monitoring and implementation program. This report identifies areas of low and high vulnerability to water quality impacts from irrigated agriculture, and areas having data gaps that indicate the need for further evaluation. The GAR supports the Central Valley Regional Water Quality Control Board’s Waste Discharge Requirements for the Long-Term Irrigated Lands Program and informs the Central Valley SALTS Basin Plan process. The Sacramento Valley generally has high quality groundwater, although there are areas with water quality concerns that need to be addressed. The goal is to preserve these high quality groundwater resources in the Valley for future generations, while continuing to support economic and environmental uses in the Valley. Together, these comprehensive reports pose the question: are we at a tipping point on the sustainability of our groundwater resources in certain parts of the Sacramento Valley? The conclusion in both reports is clear–the Sacramento Valley must improve our efforts to ensure sustainable groundwater management. We should also be collectively exploring the efforts necessary to maintain a balanced water system, including both the supply and demand parts of the equation. This will require all water users in the Sacramento Valley working together toward this common goal. It is the intent through these reports to better understand this invisible resource, to bring greater awareness to its vulnerability, to paint a picture of the real challenges we face in preserving our groundwater resources, and to provide more sophisticated tools to actively manage our water and land resources for all the beneficial purposes described above. Most importantly, we encourage the leaders in the Sacramento Valley to make a conscious and concerted effort to better understand the surface and groundwater resources in their area and to work together to assure that we have the appropriate technical, institutional and legal knowledge and tools to define and measure sustainability and support local groundwater management. We must assure sustainability of our water resources going forward. To better understand and manage groundwater resources for local uses in the Sacramento Valley, local public agencies have adopted groundwater management plans under the AB 3030 process (Water Code §10750 et seq.) and other specific authorities. Sacramento River Hydrologic Region Click on the map for a larger view. Groundwater monitoring is an integral part of this management for the region to ensure the proper management and protection of the resource. Groundwater management is also an element of integrated regional water management programs in the Sacramento Valley. Additionally, the Legislature in 1984 adopted Water Code §1220 and counties across the region have adopted groundwater ordinances designed to protect groundwater and the health and welfare of the citizens of these areas. Sacramento Valley Counties with Groundwater Ordinances Click on the map for a larger view. In the Sacramento Valley, groundwater resources are actively managed for the safe-yield of the aquifer systems.